The vehicles are able to autonomously find the required parts and then transport them to the packing area. MUNICH (Bloomberg) -- BMW Group is testing self-driving vehicles on its factory floors in the form of suitcase-size robotic trolleys as part of an automation drive that the automaker expects will help cut costs by 5 percent per car annually. 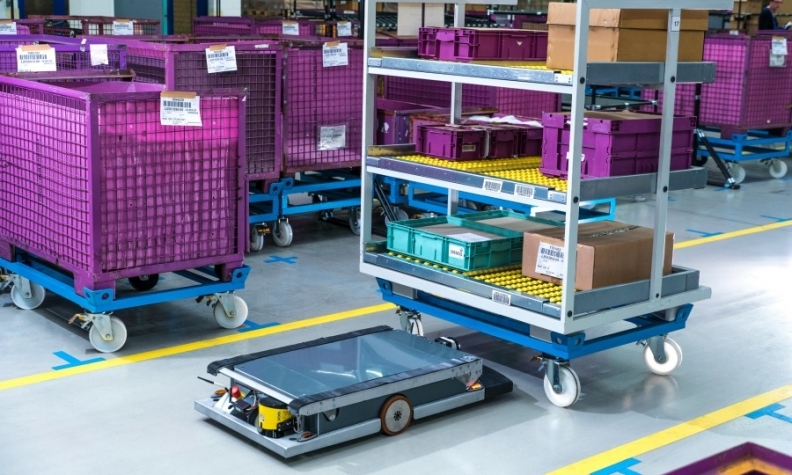 In a project started this month at BMW's logistics center in Wackersdorf, Germany, the vehicles autonomously find the desired parts container, slide under it and transport it to the packing area. The system saves money over the current manual process with shorter response times and improved inventory flows, Oliver Zipse, BMW's production chief, said in an interview. "If I'm not smart about getting the right parts to the right places, the whole line becomes cluttered with parts standing around," said Zipse. The automaker plans to roll out the automated trolleys, which BMW makes in-house, to other warehouses after a six-month trial. The program is part of a broader effort to squeeze out several hundred million euros in costs in the coming years to fund the development of self-driving features and other technologies for its cars, investments that may not pay off for years. CEO Harald Krueger said at the presentation of BMW's "Next" strategy last week that streamlined operations are "imperative" for investing in the future. With assembly lines already sharply honed, moving around parts is one of the last remaining areas open for improving productivity. The process has also become increasingly complex as factories often produce multiple models on a single line and more and more customization options are being offered to woo modern consumers. The goal of the changes is to reduce production times to an average of 30 hours per car, and BMW is "not far off," Zipse said, declining to specify the current work rate per auto. For rival Mercedes-Benz, production averaged 61 hours per car in 2005.